It is hard to beat a site visit for connecting with the vital work that our grantees do. But they are not always as fun as the one I made to the Cradle Beach respite weekend on a chilly Saturday morning this March. Cradle Beach is best known for its inclusive summer camp sessions, but the Tower grant that I monitor supports four respite weekends scheduled during the rest of the year. The beach itself is not particularly welcoming this time of year, but there is plenty of indoor space at Cradle Beach’s impressive lakeside compound in Angola, New York. I joined the 15 weekend campers just as they welcomed two basset hounds to the party. 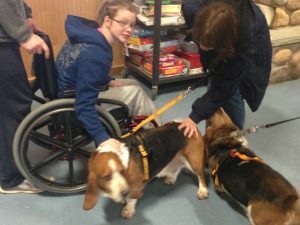 There was a wild tangle of limbs, wheelchairs, and wagging tails. The campers had arrived Friday evening and would stay until mid-day Sunday. After the love fest that was the therapy dog visit, campers drifted back to other morning activities: Easter egg decoration, ping pong, and the computer room – to name just a few. Most campers were new to Cradle Beach. Respite weekends, in addition to giving parents a well-deserved break from care-giving, help these young people gain the confidence to tackle one of Cradle Beach’s 10-day summer sessions. Bonnie Brusk, Director of Youth Services for Cradle Beach, was my host and tour guide. Bonnie’s enthusiasm and clear love for her job — even after 44 years with Cradle Beach! – radiates from her. Bonnie explained the extensive supports that make all the fun possible at the respite weekends. The counselor-camper ratio is 1:1. The weekend’s campers represented a range of personal challenges: spina bifida, muscular dystrophy, cerebral palsy, Down syndrome, autism, and even the very rare Rasmussen’s syndrome. Counselors and a nurse are on site 24/7. Two staffers work in shifts to do nighttime room checks – every camper, every hour. All facilities and procedures have to comply with standards set by the NYS Office for People with Developmental Disabilities. But you don’t really notice all the “support” stuff. While it certainly feels like a safe environment, it isn’t always easy to tell the staff from the campers. In many respects, these are just kids, goofing around, making friends, and clearly having a great time. Wish I could have stayed for movie night.